Since the early 2000s, NCBS has significantly expanded into the areas of ecology, evolution and conservation biology. As part of its broad research, training and outreach activities, NCBS has developed a series of field stations in collaboration with other partners all over India. As the next phase of this growth in organismal biology, conservation biology and public outreach, NCBS has now established the Museum and Field Stations Facility. The goal of this facility is to streamline our field operations, to provide space for long-term archival of important biodiversity-related materials, and to provide opportunities for public outreach through which we will efficiently and effectively connect to the larger society and the stakeholders. The Museum and Field Stations Facility has three components, with specific purposes and goals as outlined below. NCBS Field Stations: NCBS has field stations strewn across the country in different habitat types, elevations and biogeographic regions. Some of the field stations are managed in collaboration with other institutions, some are managed exclusively by NCBS. The field stations facilitate our field research and teaching activities. They provide state-of-art facilities for field research, including easy access to natural habitats and biodiversity, clean dry places for bench work, equipment and instruments such as microscopes and weighing balances, and comfortable accommodation. Each field station provides local logistical support for visiting scientists from NCBS, collaborating partners and other research scientists. The field stations work closely with the state forest departments, local Non-Governmental Organizations (NGOs) and other stake-holders. Each field station is managed by an NCBS faculty member, who is the contact person responsible for smooth operation. NCBS Science Museum: NCBS Science Museum showcases the beauty and complexity of nature, instilling a sense of wonder and awe towards life around us. It provides opportunities for students and lay people to interact with scientists and learn about latest discoveries in biological sciences through the means of audio-visual displays of various kinds. It provides space for educational activities for larger audiences, especially students of all stages. This is a major interface at which NCBS interacts with the larger society that supports our research and gains from our findings. The Science Museum offers exhibits and displays that showcase biodiversity of India, from microscopic unicellular organisms to gigantic elephants and whales. It shows how nature works, from cellular process that have important ecological implications, to how organisms interact with the environment and with each other. The museum gift shop distributes merchandise and materials related to NCBS, science and public outreach, including gift items, souvenirs, books, and reports. 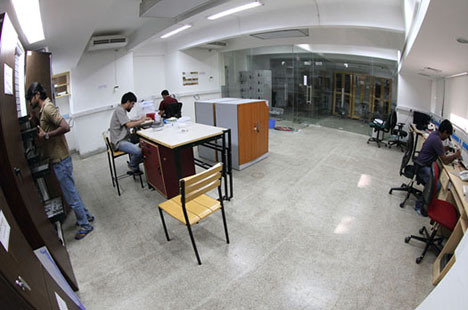 NCBS Research Collections: NCBS maintains an air-conditioned, completely climate-controlled Research Collections unit. It holds biodiversity-related and other materials that are important for our taxonomic, phylogenetic, population genetic, and other evolutionary, ecological and conservation research. The collections contain dry (e.g., insects) and wet materials (e.g., marine arthropods and herpetofauna). There is an adjacent but separate desk and work area for curators and research scientists working in the Research Collections. The long-term goal of this facility is to maintain world-class, modern research collections that include geo-referenced data and a DNA library for all the specimens, with the associated information centrally databased. The facility is well-equipped with microscopes, imaging facility, work desks, and instruments and supplies required for taxonomic and ecological work of various kinds. We envision this facility to serve a broader range of scientists doing a wide range of research projects from various fields. This forms a long-term reference for any biodiversity-related work in India.